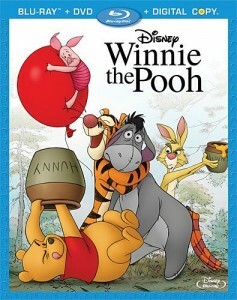 The New ‘Winnie The Pooh’ Movie Has Just Been Announced and Detailed For Blu-Ray & DVD!!! Burbank, Calif. (September 9, 2011) – Walt Disney Studios proudly invites families and audiences of all ages to return to the HundredAcre Wood with some of the world’s most beloved characters, as “Winnie the Pooh,” the delightful all-new animated feature film comes home to Blu-ray Combo Pack for the very first time, as well as DVD and Movie Download on October 25, 2011. Reuniting audiences with Pooh, Tigger, Rabbit, Piglet, Owl, Kanga, Roo and last, but certainly not least, Eeyore (who has lost his tail), “Winnie the Pooh” is a honey of an in-home release containing hours of immersive bonus features, including exclusive animated shorts “The Ballad of Nessie” and “Mini-Adventures of Winnie the Pooh: The Balloon;” a sing-along viewing option; an informative behind-the-scenes featurette for the whole family and deleted scenes with director commentary – all available on Blu-ray Combo Pack. Inspired by the beloved stories from A.A. Milne’s books and crafted in Disney’s classic style, “Winnie the Pooh,” is the most critically-acclaimed animated film of 2011*. It is narrated by the voice of John Cleese and features the vocal talents of legendary voice actor Jim Cummings(over 350 voices including Gnomeo & Juliet) and a host of other distinctive actors including Craig Ferguson(TV’s ‘The Late Late Show with Craig Ferguson’), Tom Kenny (TV’s ‘SpongeBob SquarePants’), Bud Luckey (Toy Story 3) and musical performances by Zooey Deschanel (indie folk band “She & Him”). The all-new “Winnie the Pooh” brings back to life the timeless charm, wit and whimsy of the original featurettes and characters. Sure to become a family favorite for every household, it is directed by Stephen Anderson (Meet The Robinsons) and Don Hall (The Princess and The Frog) and Executive Produced by John Lasseter. · Exclusive bonus short “Mini-Adventures of Winnie the Pooh: The Balloon” – In this charming short, Pooh comes up with a daring plan to get a hold of some honey by fooling a group of bees. · “The Ballad of Nessie” – The animated short film included in the theatrical release is the heartwarming tale of how Nessie found her new home in the Loch Ness. · “Winnie the Pooh and His Story Too” – A fun and informative behind-the-scenes look at the film, designed for the whole family. 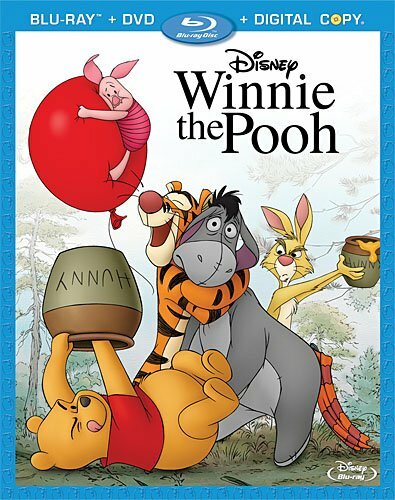 Hosted by John Cleese (narrator of the film), and with occasional help fromPooh himself, this featurette explores Winnie the Pooh’s history from his beginnings as a character in a book, to his continued life in the movies. The filmmakers reveal how they worked to keep the look of the characters and settings in this movie consistent with their first appearances on-screen in1966. Pooh, being a bear of very little mind, finds much of this confusing, but the Narrator and the filmmakers make it all clear to Pooh – and you! · Sing-Along with the Movie – Follow the red balloon and changing word colors to seven song lyrics featured in the film. Disney returns to the Hundred Acre Wood with “Winnie the Pooh.” Featuring the timeless charm, wit and whimsy of the original featurettes, this all-new movie reunites audiences with the philosophical “bear of very little brain” and friends Tigger, Rabbit, Piglet, Owl, Kanga, Roo – and last, but certainly not least, Eeyore, who has lost his tail. “Ever have one of those days where you just can’t win, Eeyore?” asks Pooh. Owl sends the whole gang on a wild quest to save Christopher Robin from an imaginary culprit. It turns out to be a very busy day for a bear who simply set out to find some honey. Disney’s all-new “Winnie the Pooh” movie is inspired by three stories from A.A. Milne’s books in Disney’s classic, hand-drawn art. (The Princess and the Frog, Meet The Robinsons), the film was supported by a variety of industry and highly-creative Disney veterans including Producers Peter Del Vecho (The Princess and the Frog, Chicken Little) and Clark Spencer (Bolt, Meet The Robinsons), Executive Producer and two-time Academy Award®-winning director John Lasseter (Toy Story franchise, WALL●E, Bolt) and senior story artist Burny Mattinson (Academy Award®-nominee for Best Animated Short Film, Mickey’s Christmas Carol, 1983 and key animator on the 1974 Winnie the Pooh and Tigger Too!). Kristen Anderson-Lopez (TV’s ‘The Wonder Pets,’ Off-Broadway’s ‘In Transit’) as Kanga, Wyatt Hall (seven-year-old son of director Don Hall) as Roo and Huell Howser (this was his first role as an actor) as Backson and Jack Boulter (this was his first role as an actor) as Christopher Robin. The amazing musical scores featured throughout the film were created by Tony® Award-winning songwriter Bobby Lopez, and his wife Kristen, who wrote all of the six spirited new songs for Pooh and his pals, including “The Tummy Song,” “A Very Important Thing To Do,” “Everything Is Honey,” “The Winner Song,” “The Backson Song,” and “It’s Gonna Be Great.” Lopez is behind the Broadway hits “Book of Mormon” and “Avenue Q” and together they’ve written for Nickelodeon and Disney, including the stage version of “Finding Nemo” and composed songs for several episodes of “The Wonder of Pets,” which earned him two Daytime Emmy® Awards in 2006 for Outstanding Achievement in Music Direction and Composition. The New ‘Winnie The Pooh’ Film Has Been Announced and Detailed for Blu-Ray and DVD!!! New Winnie The Pooh Clip Emerges!!!! This entry was posted on Saturday, October 1st, 2011 at 1:25 pm	and is filed under Film. You can follow any responses to this entry through the RSS 2.0 feed. You can skip to the end and leave a response. Pinging is currently not allowed. « FedMex Reviews ‘Machine Gun Preacher’!! !